There can be few, if any, venues in Australia that have taken part in as many collaborations as Sydney's Frankie's Pizza. Given it's a place where many brewery staff tend to end up late at night, it's easy to imagine how conversations could get started. Certainly, ever since they hosted their first multiple collaboration beer launch event at an earlier Sydney Craft Beer Week, there's been little let up. 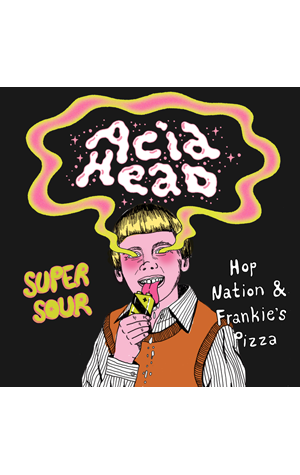 Among those making their debut at the 2017 Sydney Beer Week is Acid Head, the venue's collab with Melbourne based Hop Nation. If the name wasn't enough to tell you what to expect, the "super sour" subtitle should do the trick. It's a hop driven kettle sour, one with a simple malt base upon which was layered Mosaic, Motueka and Citra hops both in the whirlpool and throughout fermentation. The brewers tell us the outcome is a beer "pale straw in colour, with a vibrant and fresh aroma of lemon drop, grapefruit and guava. Lively crisp and sour on the palate with a hoppy finish that leaves you salivating."